It is unsurprising that there are chapters on literature, painting and music in this volume - if they're not arts, nothing is. It is almost as predictable that there are chapters devoted to topics such as depiction and metaphor. The issues raised by depiction and metaphor are central to the artistic use of pictures and language, yet these topics do not pertain exclusively to art (there are lots of pictures that are not artworks, such as maps, diagrams and holiday snaps; people use metaphors in all sorts of contexts). 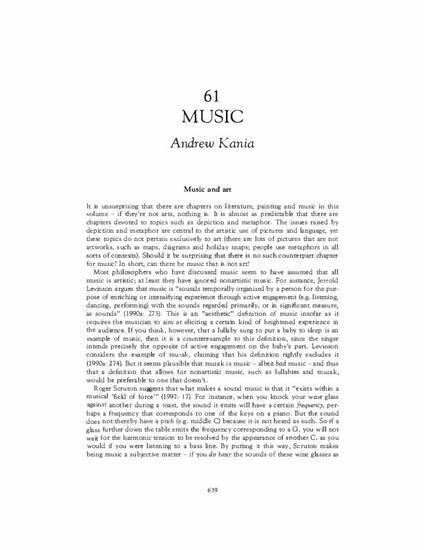 Should it be surprising that there is no such counterpart chapter for music? In short, can there be music that is not art? Kania, A. (2013). Music. In B. Gaut & D. Lopes (Eds. ), The Routledge companion to aesthetics (3rd ed., pp. 639-648). New York, NY: Routledge.